"My sense was that wasn't a great surprise, what happened. We know the position that the Congress has, at least the position of many Republicans in Congress," Fabius said. "In fact, we discussed this the other day with President Obama when we were having dinner. For him, it wasn't a surprise." The House approved two Senate resolutions yesterday aimed at killing the Clean Power Plan regulations that will restrict carbon emissions from new power plants. They passed 242-280 and 235-188, mostly along party lines, and now head to Obama's desk. U.S. Special Envoy for Climate Change Todd Stern said he has been assuring his counterparts from other nations here that the resolutions will get a swift veto. "That will not ultimately prevail. The president is not going to accept such resolutions, and I am entirely confident the Clean Power Plan will go forward," he said. The Clean Power Plan is expected to reduce emissions from the electricity sector 32 percent from 2005 levels by 2030. That will go a long way toward helping the United States meet its larger pledge of cutting economywide emissions 26 to 28 percent below 2005 levels by 2025 as part of an anticipated global deal. "We decided explicitly to bring these resolutions to the floor as the climate change conference is taking place in Paris because we want the world to know that there are differences of opinion between the Congress and the president on this issue," Rep. Ed Whitfield (R-Ky.), who authored one of the resolutions, said on the House floor yesterday (ClimateWire, Dec. 2). But if Republicans hoped to send a message to diplomats here, they failed to pierce the thick green bubble enveloping the talks. 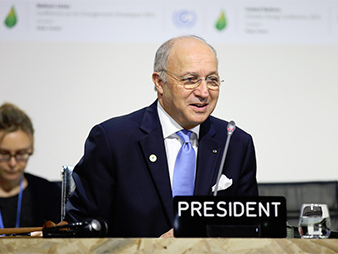 French Foreign Minister Laurent Fabius lashed out today at congressional Republicans for passing a resolution aimed at blocking President Obama’s Clean Power Plan. Photo courtesy of IISD. "I don't actually think that had much of an effect here," Stern said. "I think it produces questions, so I have had countries asking about it. What I have said is that the Clean Power Plan is going to go forward." Alden Meyer, director of policy and strategy for the Union of Concerned Scientists, called the House vote "a little bit of shadowboxing." "The momentum is not affected at all by this vote. It's a bit of political drama," he said. "I don't think it will have any impact on the U.S. agenda here or the ability to negotiate a deal." Fabius said Obama broached the subject of pending votes himself while in Paris this week to help open the talks and meet with French President François Hollande. He pointed to a new public opinion poll showing that the majority of Americans are in favor of joining a global climate change agreement and said he believes an appreciation of the climate threat is growing among Republican voters, if not always among the politicians who represent them. "I think the vote that took place is not a surprise and the American administration knows exactly what kind of way ahead it needs to follow," Fabius said. "What matters is that this does not prevent things from moving forward."